I am so excited to write about this product. I have to confess that I’ve been a massive fan of Neom for several years now. 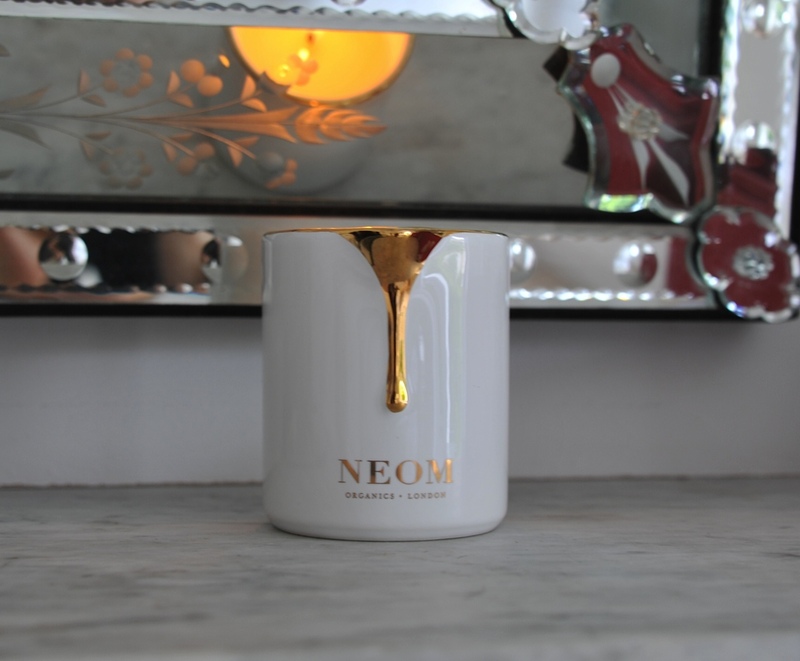 The company was founded by working mother and former magazine journalist Nicola Elliot, who for a hobby trained as an aromatherapist, and then decided to pursue it full time by launching Neom with business partner Oliver Mennell (the name Neom is a combination of their initials). If, like me, you are a believer in the powerful therapeutic effects of essential oils then you will probably love this range. Their bath oils, reed scent diffusers, and candles are dotted all over my house. 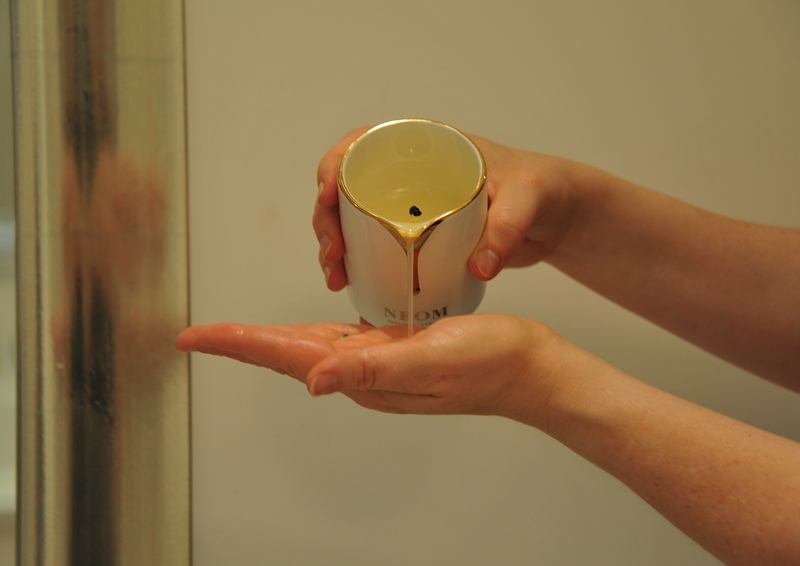 And, when I’m stuck for a gift for someone, a gorgeous three wick Neom candle in a scent that I feel will suit them is always just the right size! The smell is Heavenly. Powerful. AMAZING. I can’t-stop-sniffing-my-arms amazing. The-gorgeous-scent-seems-to-go-right-into-my-SOUL amazing. I wish there were a scratch and sniff area on my blog so you could smell this for yourself. If the scent alone didn’t have me doing cartwheels, the effectiveness of the treatment would. I don’t use body lotions on my skin because they rarely work on me, and they are often full of chemicals I’d rather avoid (Instead, I use coconut oil, sesame oil, almond oil, and a few Dr. Hauschka and Weleda body oils). What I’m impressed with about this product is that the next day, I can still feel it on my skin, which is especially surprising on my always-dry legs. This is a superb product for me because it ticks all the boxes: it smells INCREDIBLE, it works better than anything else I’m using, and it is luxuriously natural. The treatment candle comes in two scents; the one I have is the Real Luxury scent (Jasmine, French Lavender, and Brazilian Rosewood) which is created to be de-stressing, and the other scent, Tranquility (English Lavender, Sweet Basil, and Jasmine) which is meant to be a sleep aid. They are both gorgeous, but I have a slight preference for the Real Luxury scent over the Tranquility one. Given my gushing review, I feel I have to add that I am not being compensated by Neom in any way, nor was I given these for a review (Although, Neom, if you’re reading, I’m very open to future freebies 🙂 ). Like everything on this blog (like it or not) the opinions expressed are 100% my own and ain’t nobody can buy my opinions (that’s my Southern coming out; it usually only happens when I’m tipsy). So, are you as crazy for aromatherapy and candles as I am? That’s a great idea! My aromatherapy candles end up gathering dust but I think I’d use this one. I have only used natural oils on my face for many years now so I’m already a fan. Your scrumptious description of the fragrance has completely sold Neom to me, I’m up for anything that smells Tranquil! I’ve burned the regular Tranquility candle in my son’s room since he was born; I find it very calming, and I think he does too! This wax sounds amazing. I must admit I hadn’t heard of it here in the UK. Like you, my legs are always dry. The doctor’s prescribed a cream to rub all over my flaking older skin, which works in the short-term, but soon wears off. The best I’ve tried is olive oil sprinkled with salt for a scrub and moisturize. Wow, this sounds like a real treat! Thanks for joining the first #funsummerfinds linkup! At first I was confused, like how does a candle treat your skin but it sounds absolutely amazing! And the packaging is beautiful so it would look great sitting in my bathroom.